IF you spend a great deal of time in France it may be worthwhile buying a left hand drive car, that’s the easy part, the challenge is the paperwork. Just like the UK you need to be the registered owner of the car and for that you need to apply for your carte grise. If you are thinking about buying a second-hand car one of the first things you should do is visit your local mairie. Here you should pick up two forms, the first is the Certificate d’Immatriculation d’un Vehicule that asks for your name and address details. The second is the Certificat de Cession d’un Vehicule which is a three part carbonised form and is completed by both the seller and buyer. It is also clear that buying a French car will prove easier if anything goes wrong, as most garages are equipped for them, foreign car parts can take some time to arrive. So once you have decided on your dream motor the next thing is to sit down with the seller and check that the paperwork is in order. Just like in the UK see if there is any service history but also the seller should be able to provide you with a Certificate de Non-Gage. This provides details of the car's history highlighting if there is any credit still outstanding on it or if it has been involved in any accidents. Also make sure you get the old carte grise which as it suggests is a grey card with the current owners details on it. The owner also needs to draw two diagonal lines across the card and write Vendu le... (date) and sign the card as well. The card should have small stickers on which show the most recent contrôle technique stamps with dates, which are the equivalent of the MOT. And then you should also make sure you have the most recent contrôle technique report to prove the car has passed, and which is renewed every two years. Both you and the seller should complete the Certificat de Cession d’un Vehicule at this point. Finally it may be worthwhile having a brief letter drawn up with the price of the car and both your own and the seller’s signature. Then it is off to the local mairie again, with all your paperwork in tow. 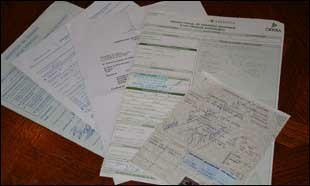 You will need to take all the above papers as well as your passport and evidence of a permanent address in France. This could be a recent utility bill or rental agreement, just make sure the address matches the details you have already completed. And although there is no car tax in France this is where the government gets a slice as you will need to pay to get your car registered. The fee is dependent on the type of car, naturally the bigger and more powerful the more you will pay. Another point to remember is if you buy a car from a different department you will have to change the number plate once you receive your new carte grise (update: not in operation from 2009). Although this is how it was for myself when I registered for a carte grise some departments may do things different, but if you have all these papers you should be OK.
Is there also a certificate obtained by the police (not sure of it's exact title!) proving that the car is not subject to any legal sanctions? Does the vendor provide that? The Certificat de Cession - does this only come into play on the final exchange of the vehicle? Who should provide that? Any information on this gratefully received!! Hi Nicky, the Certificat de Non-Gage is the document that highlights if there is an outstanding loan on the car. But it is also worth dropping in on the Mairie as they will be able to explain things further. I am looking at buying a French registered car in the uk from a garage. I have the chassis number & reg number. how can I check that there is no outstanding debt, or accident history as well as checking whether the car is not stolen? You are looking for a 'Certificate de Non-Gage' and the seller should provide these details. Im buying a lhd car in the UK and want to register it in France..Anyone could guide me about paper works(carte grise,v5,insurance,..and stuffs..